Published Saturday, August 23, 2008, OK personal/derivative use; link www.lovethatimage.com. 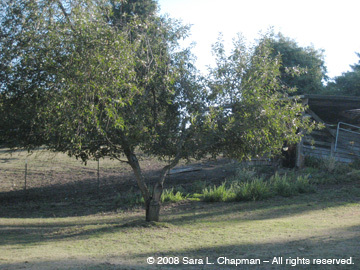 In back of our yard is a horse pasture. It is beautiful even if the horses are in the barn. Published Thursday, August 21, 2008, OK personal/derivative use; link www.lovethatimage.com. This is my first Skywatch Friday post. Doesn’t it look like a guy grinning and wanting to shake hands? Taken at a golf course in Kent, WA. They golfed; I took pictures. 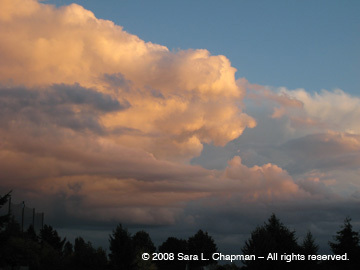 For more Skywatch Friday photos click here. Published Tuesday, August 19, 2008, OK personal/derivative use; link www.lovethatimage.com. 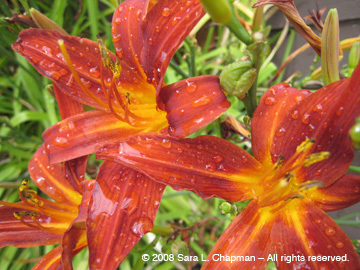 Right after I watered in the heat spell we had, the daylilies were looking particularly fine. Here’s a Ruby Tuesday photo for you. For more Ruby Tuesday photos, click here. Published Monday, August 18, 2008, OK personal/derivative use; link www.lovethatimage.com. I have been posting lots of flowers, and they truly thrill me, but here is something different. I was walking in Old Burien and saw a The Yarn Stash (http://www.burienyarnstash.com/), a knitting shop with a storefront display of . 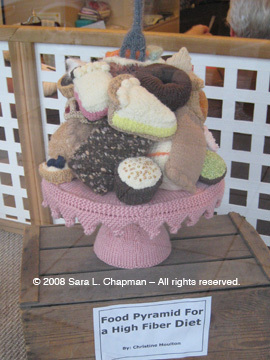 . . knitted food. Or maybe crocheted. I loved it. 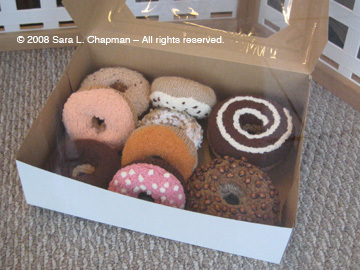 Here are the doughnuts . . .
. . . as well as knitted angora marshmallows and the knitted food pyramid (high fiber! ), all by Christine Moulton. Too funny! 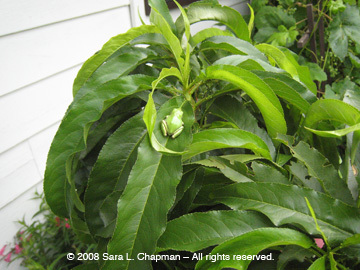 And not to neglect our general garden theme, a teensy treefrog on the leaves of our super dwarf peach tree in Des Moines. You can just see the colorful peach peeking through the leaves on the lower right. Published Wednesday, August 6, 2008, OK personal/derivative use; link www.lovethatimage.com. 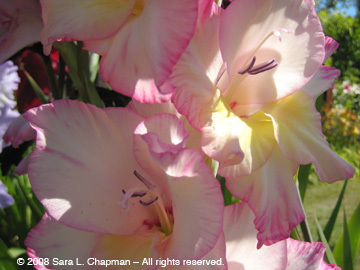 The big push of flowers is easing off now, but still a showy display from the glads. They look so thrilling in the brilliant Seattle summer sunshine. 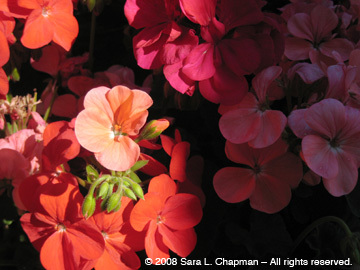 And yesterday the geraniums looked just perfect. Somehow the bright sun provided a mysterious shadow effect in this photograph. Published Friday, August 1, 2008, OK personal/derivative use; link www.lovethatimage.com. We’re having a housewarming party tomorrow for the new place in Normandy Park. 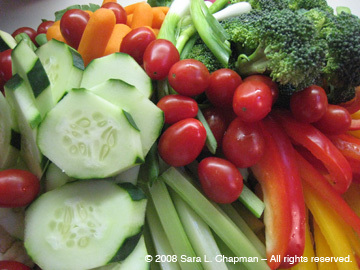 Can’t have a party without a vegetable plate. Isn’t it pretty? Published Tuesday, July 29, 2008, OK personal/derivative use; link www.lovethatimage.com. 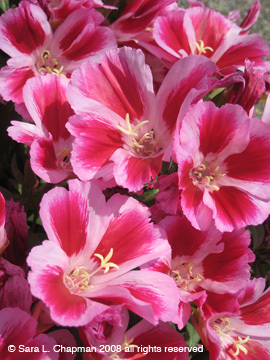 I love godetia. They grow from seeds easily, and then volunteers pop up next year, never invasive, doesn’t need staking, even great cut flowers in a bouquet. I forgive it its lack of scent. 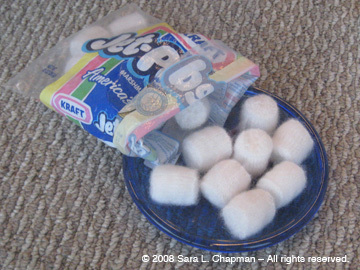 Nothing is perfect, but these are a nine out of ten, for me. 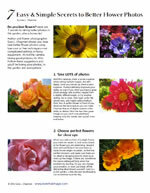 Okay, maybe only eight, because flower fragrance is so important, after all. Published Wednesday, July 23, 2008, OK personal/derivative use; link www.lovethatimage.com. Went to meet a potential client and saw a gorgeous garden on the way. 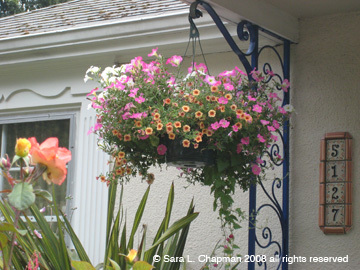 Here is a lovely hanging basket for you to enjoy. Published Tuesday, July 15, 2008, OK personal/derivative use; link www.lovethatimage.com. I haven’t been taking enough pictures recently to have ones worthy of sharing, so I thought I’d look at last year on this date and see what I found. Voila! Some very nice ones. 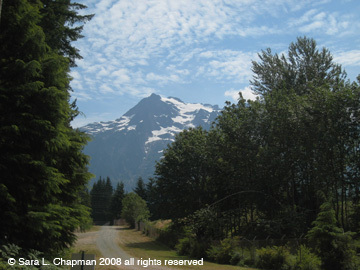 The first was taken at the Darrington Bluegrass festival, in a sunny moment. I do not know the name of the beautiful mountain. 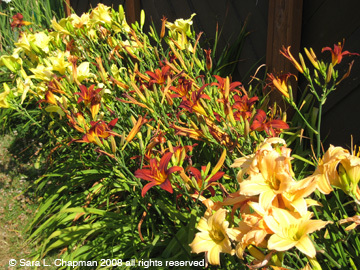 And here are some daylilies that I grew in the Des Moines house. They are only in their third year here in the ground. Our new house in Normandy park will definitely have some of these, after the garden gets going. Published Monday, July 7, 2008, OK personal/derivative use; link www.lovethatimage.com. Back at my old place, doing some gardening while waiting to sell it, a little drizzle was followed by a bit of weak sun. 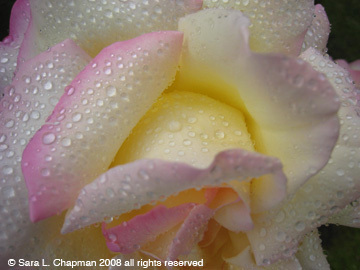 I saw a Peace rose glistening and had to run get my camera. Published Monday, June 23, 2008, OK personal/derivative use; link www.lovethatimage.com. We went on the ferry and strolled through several gardens on the Whidbey Island Garden Tour on Saturday. While none of the gardens truly thrilled me, there is always much to learn and photograph. 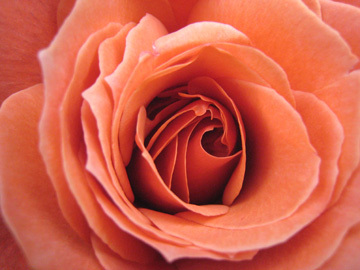 This rose is called Hot Cocoa. 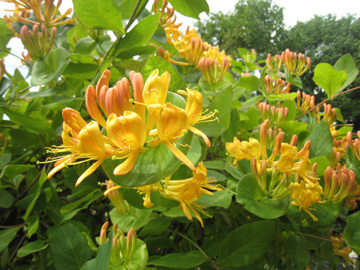 There was also a honeysuckle vine I had never seen. Alas, it had no scent. But how beautiful it was! Published Friday, June 20, 2008, OK personal/derivative use; link www.lovethatimage.com. Our new neighborhood has a few lovely gardens. This strip of foxgloves takes my breath away.